It is really difficult to believe that it has been a year already since we were agonizing over the water damage to our old house in the (formerly) golden state. All of the difficulty of making numerous 300+ mile six-hour each way trips to the old homestead were happening, starting just over a year ago. There were myriad chores: external property maintenance, insurance claims and adjustments, undamaged property disposal and repairs to the plumbing which was the original cause of the flood. And now, we’ve been out of the old place for over nine months and couldn’t be happier about it. We have had our minds on getting our Arizona home improvements completed and are nearly finished. Best of all, we’re doing well in the financial end of things, having liquidated the excessive obligations of owning the “albatross” in California. You know, property tax, mortgage payments, utilities, gardener, road trips out there to do “whatever” and all that. Tempus Fugit translates from the Latin to “time flies” and it certainly feels like it has since those desperate days. The best part about the passage of time in this case is that we don’t feel any older because of it. Damsel and I are glad that we’re in a position to get on with our retirement unabated by fixing up the old and improving the new. There has been the possibility of rainfall most of the day, but I’m glad it waited until late afternoon. The sun, getting ready to set in the west, was not obscured by clouds and shone brightly toward the rainfall to the east of us making bright rainbows visible. It rained hard here for a while before the clouds moved off to the east where it continued to rain. The desert always needs rain, so we’re thankful for this little storm. The rainbows varied in intensity and were double bows occasionally. 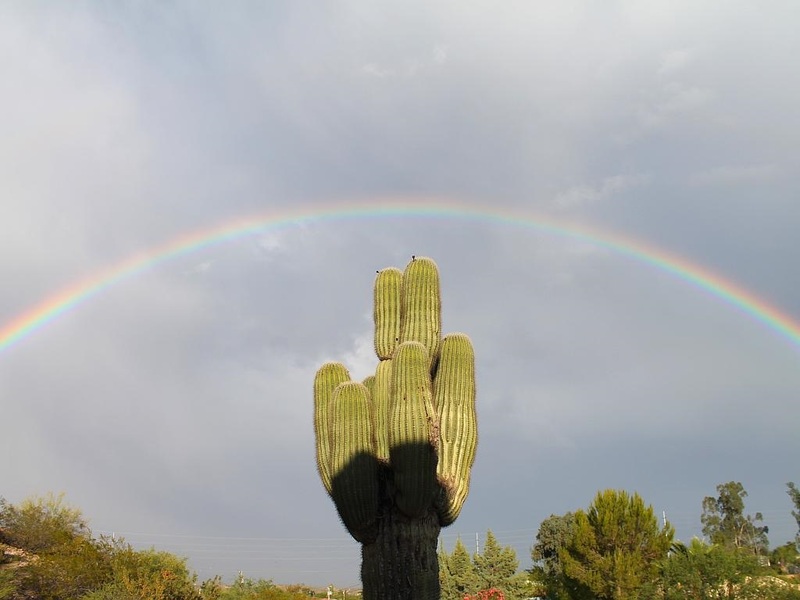 I stepped outside the courtyard gate and captured this nice shot of a full arc over our big saguaro out front. Click on the image to enlarge. 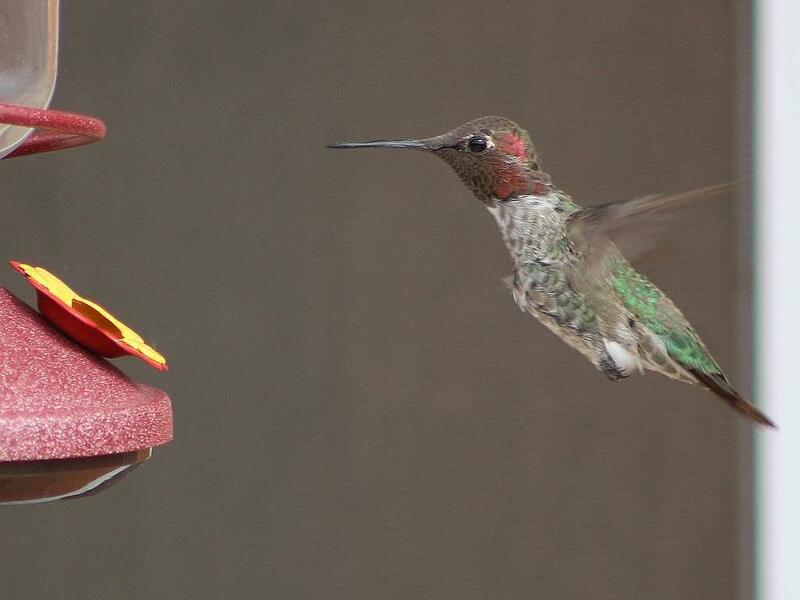 It is always a pleasure to see the little hummingbirds partake of Damsel’s feeders behind the patio. I was on the RV drive after hanging a bird seed bell up on the hill when this little guy came buzzing up to the feeder a few feet away. I had the camera with me so I pointed and shot several images as the bird browsed the feeder. I have been (sometimes) in the habit of taking the camera with me when doing something outdoors just in case a photo opportunity should present itself. Had I had the camera with me this morning (and I didn’t) when I took the dogs out for a run, I might have been able to capture a shot of a pair of adult quail and about a dozen little ones we encountered on the RV drive as we were returning from the road. The broods of quail have been plentiful around the area, but I really haven’t been able to get a decent shot of them. Maybe later. Camera Specs: Canon EOS REBEL SL1, 1/400 sec, F5.6, ISO 250, Focal Length 300mm. Click on the image to enlarge. Only about a week later than the first flowers from last year, my first red bird of paradise (a.k.a. Pride of Barbados) bud opened today. Of the three caesalpinia pulcherrima shrubs in the courtyard, this is the largest in spring growth. Two years ago, it was the retarded one with the others growing larger before it did. But they all grew and had flowers all summer long. It is a shrub growing to 3 m tall. The leaves are bipinnate, 20–40 cm long,bearing 3-10 pairs of pinnae, each with 6-10 pairs of leaflets 15–25 mm long and 10–15 mm broad. 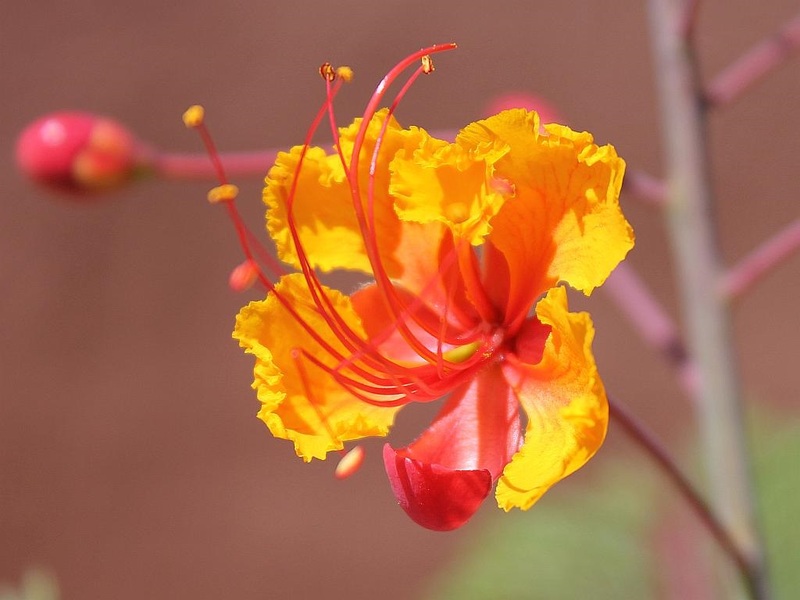 The flowers are borne in racemes up to 20 cm long, each flower with five yellow, orange or red petals. The fruit is a pod 6–12 cm long. 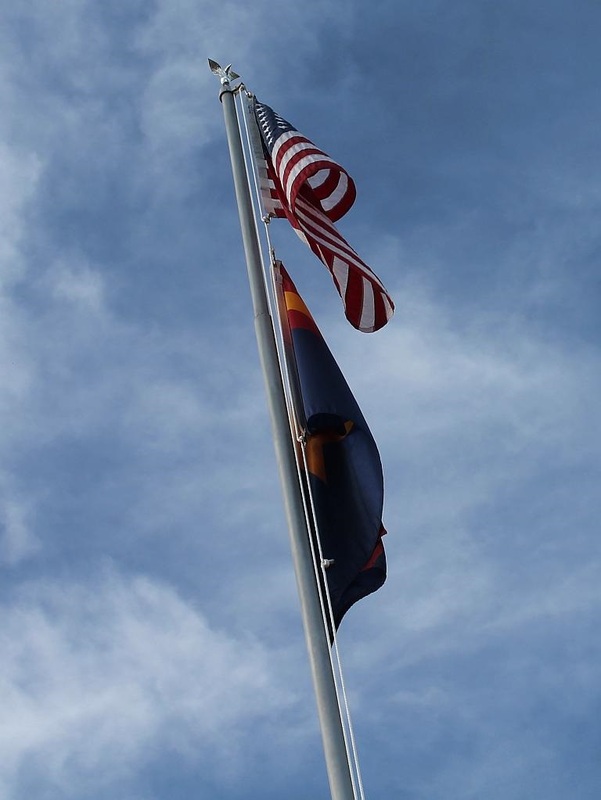 This is the way our flagpole and the two flags look as seen from the courtyard. 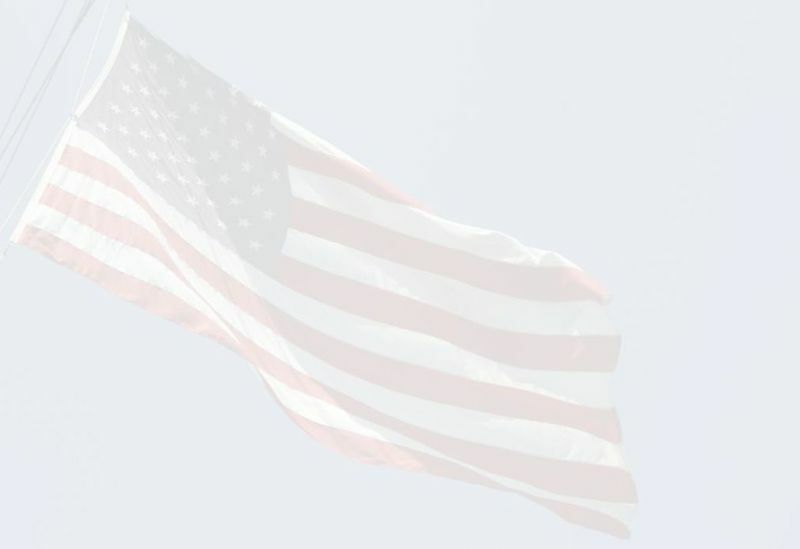 The sky is nicely accented by wispy clouds with the flags in the foreground as watched over by the eagle on top of the pole. Art and Patriotism all in one photo, in my opinion. Click on the image to enlarge. We have been maintaining a Global Warming Resources page on this website since 2005 or so. I recently went through and checked some of the links and found that some things have disappeared over the last seven or eight years, so I deleted them from the page. Clicking on the animation above will open the resources page in a new tab or window (browser dependent). The page contains a list of our favorite posts on the topic of climate change, a number of other climate-related websites (cleaned up to eliminate dead links), some favorite articles on other sites plus a complete scrolling repository for all climate-related posts written on this site.